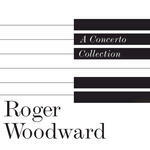 A concerto collection / Roger Woodward. Southern cross : for piano, violin and orchestra / Barry Conyngham. Southern Cross ; Monuments / Barry Conyngham. Instrumentation: Solo violin, solo piano, piccolo (doubling alto flute), 2 flutes (2nd doubling piccolo), 2 oboes (2nd doubles cor anglais), 2 clarinets, bass clarinet, 2 bassoons, contrabassoon, 4 horns, 3 trumpets in B flat, 2 trombones, bass trombone, tuba, timpani, percussion (3 players), celeste, harp, strings. Contents note: I. magnitude -- II. velocity -- III. duration -- IV. collision -- V. distance. Commission note: Commissioned by Australian Broadcasting Commission.. 'Southern Cross' was originally commissioned by the Australian Broadcasting Corporation. This work is a small celebration of the corporation's 70th year. 1 May 82: Sydney Opera House Concert Hall. Featuring Roger Woodward, Wanda Wilkomirska, Sydney Symphony, Niklaus Wyss.